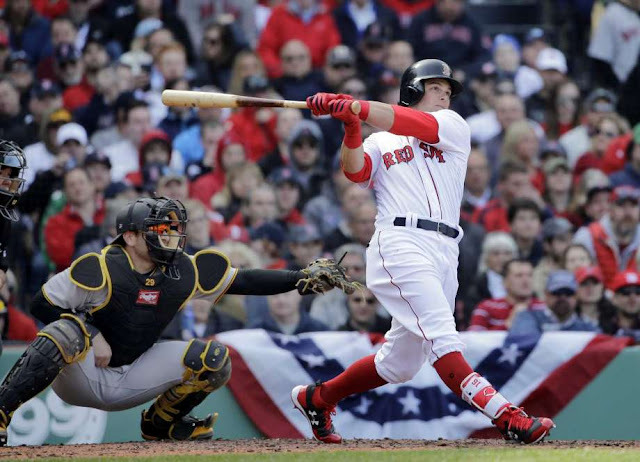 Rookie Andrew Benintendi hit a three-run homer that capped a five-run fifth inning, and the Red Sox began their post-David Ortiz era by beating the Pittsburgh Pirates 5-3 in Monday's season opener. Ortiz retired after last season after helping the Red Sox win three World Series titles, their first since 1918. Rick Porcello (1-0) gave up three runs and six hits in 61/3 innings while striking out five. Craig Kimbrel retired Starling Marte on a game-ending popup with two on for the save. "That was awesome," Benintendi said. "We're all excited to start playing games that actually matter. It was a fun experience." What manager John Farrell said has impressed him most about 22-year-old during his short time in the majors is the lack of panic. Benintendi homered on a 98 mph fastball on a 2-2 count. "He sees the ball extremely well and has a true understanding of the strike zone," Farrell said. "A pretty special young player." Boston had only two hits before Jackie Bradley Jr.'s two-out triple to right in the fifth. He scored the first run after Pablo Sandoval beat out a sharp grounder to shortstop Jordy Mercer. Sandy Leon bunted his way on, Sandoval scored on Dustin Pedroia's line-drive single up the middle and Benintendi homered. Porcello allowed only three hits through six innings. Josh Harrison had an RBI single in the seventh, and the Pirates added two runs off Matt Barnes before Andrew McCutchen struck out for the third time. Nationals 4, Marlins 2: Adam Lind's first swing as a member of the Nationals resulted in a pinch-hit, go-ahead, two-run homer in the seventh inning, and Bryce Harper went deep on Opening Day for the fifth time, leading Washington past Miami. Stephen Strasburg (1-0) allowed two runs and six hits in seven innings. It was his return to action after missing last September and the playoffs with a right elbow injury. Matt Wieters singled ahead of Lind's drive off David Phelps (0-1) that made it 3-2. Orioles 3, Blue Jays 2 (11): Mark Trumbo homered off Jason Grilli (0-1) with two outs in the 11th inning. Tyler Wilson (1-0), the fourth Baltimore reliever, pitched one shutout inning. Rockies 7, Brewers 5: Bud Black won his debut as Colorado manager, and Greg Holland got a save in his first game with the Rockies. Mark Reynolds homered, had three RBIs and scored the tying run in a two-run seventh following two defensive lapses by Milwaukee. Twins 7, Royals 1: Miguel Sano homered and drew the third bases-loaded walk during a dreadful seventh inning for Kansas City's bullpen, and the Twins won an opener for the first time in nine years. Ervin Santana (1-0) gave up two hits and two walks while striking out three over seven innings, aided by two diving catches of sinking line drives by center fielder Byron Buxton. Phillies 4, Reds 3: Cesar Hernandez opened the Phillies' season with a homer on Cincinnati's eighth pitch, and Jeremy Hellickson drove in a run with his first career triple. Hellickson (1-0) pitched into the sixth, allowing a run and six hits. Jeanmar Gomez gave up Scooter Gennett's two-out, two-run homer in the ninth before retiring Billy Hamilton on a routine fly for the save. Dodgers 14, Padres 3: Joc Pederson launched a grand slam and the Dodgers backed Clayton Kershaw with four home runs. Pederson drove in five runs, Yasmani Grandal homered twice and Corey Seager added a three-run shot. Kershaw (1-0) allowed two runs — one earned — and two hits in seven innings, struck out eight and walked none. Jhoulys Chacin (0-1) gave up nine runs and eight hits in 31/3 innings in his Padres debut. Indians 8, Rangers 5: Abraham Almonte hit a tiebreaking single in a three-run ninth inning, and Cleveland opened its American League title defense by rallying for a win over Texas. Rangers starter Yu Darvish had a 5-1 lead behind Rougned Odor, who homered twice and drove in four runs in his first two at-bats. Edwin Encarnacion tied the score at 5 with an eighth-inning homer and the Indians went ahead against Sam Dyson. Andrew Miller (1-0) struck out two in a perfect eighth, and Cody Allen got the save by striking out the side around Elvis Andrus' triple. Astros 3, Mariners 0: Dallas Keuchel allowed two hits over seven innings, Luke Gregerson and Ken Giles completed the three-hitter and Houston beat Seattle. George Springer became Houston's first player since Terry Puhl in 1980 to lead off the first game with a home run. Carlos Correa homered and drove in two runs. Postponed: The White Sox postponed their opener against the Tigers because of rain. It will be made up on Tuesday afternoon, weather permitting. BOSTON -- Pitching on Opening Day for the first time in his career -- and the first time since high school -- Rick Porcello helped lead the Red Sox to a well-rounded 5-3 victory on Monday afternoon against the Pirates. The American League's Cy Young Award winner from last season, Porcello was vintage over his first six innings, holding the Pirates scoreless. The sinkerballer's overall line (6 1/3 innings, six hits, three earned runs, one walk, five strikeouts) was skewed by two inherited runners scoring after his exit. "Everything leading up to it, the first time back out there, it's exciting," said Porcello. "Opening Day is a holiday for us in baseball. There's definitely those nerves you battle a little bit. When you get between the lines, it gets back to business." Rookie Andrew Benintendi, who is ranked baseball's No. 1 prospect by MLBPipeline.com, capped a five-run rally for the Red Sox in the bottom of the fifth with a three-run homer into the Bucs' bullpen in right field. "It's awesome," said Benintendi. "Something you dream about as a kid. For it to be here, it's awesome." The drive came off of a 97.8-mph fastball on a 2-2 pitch by Pirates ace Gerrit Cole, who allowed seven hits and five runs over five innings. "[The intent] was to throw the same one we threw 1-1, [which] kind of froze him," said Cole. "Obviously he was not going to let that one get by him again. Just kind of re-evaluate the sequence and see if we can be one step ahead next time. After we froze him on the one in, he was not going to get frozen again on it. He got the head out." Red Sox reliever Matt Barnes worked out of traffic in the three-run seventh by the Pirates, striking out Andrew McCutchen on a curveball in the dirt to end the inning. Robby Scott and Heath Hembree got the Red Sox through the eighth. Closer Craig Kimbrel worked around a leadoff double by Josh Bell to earn the save. Bradley flashes glove, bat: Jackie Bradley Jr. got Porcello out of the fourth with a fine running catch into the railing to the side of the bullpen in right-center to rob Francisco Cervelli of extra bases. The catch probability, according to Statcast™, was 55 percent, making it a three-star grab. But Bradley wasn't done there. With the bases empty and two outs in the fifth, Bradley ignited the game-turning rally with a triple off the short wall in right. The drive had an exit velocity of 110.6 mph, rating as Bradley's hardest hit during the Statcast™ era. Things went south for the Bucs from there. "I think it gave us a little momentum," said Red Sox manager John Farrell. "It was a little bit of a spark. Cole had thrown the ball outstanding and then he gets a fastball in the middle of the plate on a day he was dominant through the first four-plus innings. I think any time you see a triple, it's probably the most exciting play in the game and it further energized us." Beating the shift: Cole had a chance to stop the Red Sox rally after one run, facing catcher Sandy Leon with two outs and Pablo Sandoval on first base. But with the Pirates' infield shifted against the switch-hitter, Leon dropped a bunt down the third-base line. With David Freese out in right field, Pittsburgh had no one there to field it. Cole stared into the dugout after Leon reached safely, and the inning fell apart. Dustin Pedroia singled home one run, then Benintendi's blast gave the Sox a five-run lead. Just like that, on a bunt that came off Leon's bat at 39.8 mph, according to Statcast™, Cole's brilliant first four innings went to waste. 0 Response to "Red Sox still can pop without Papi"